The more I use Google+ the better I like it. Apart from all the other cool things you can do with Google Plus Circles, the feature I like the most is the ability to adjust the frequency of updates you receive from each Circle: so you see more of what you like and less of what you don’t like. The old “volume slider” is gone, things change… this post will too. 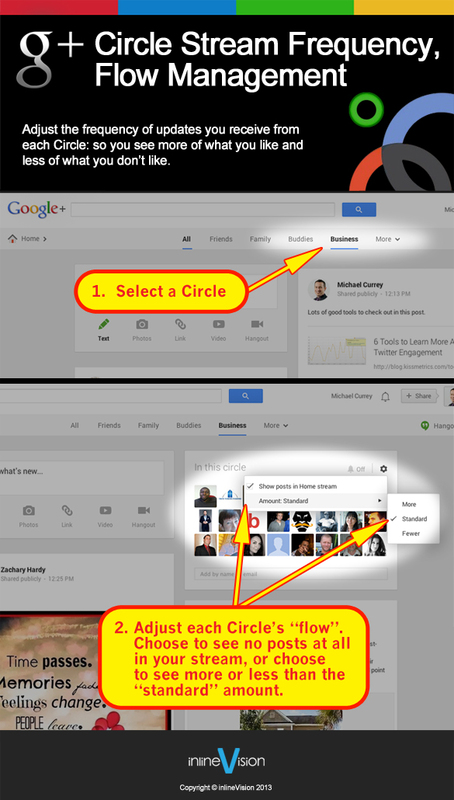 Update: May 15, 2013 – New design for Google+! No more navigation bar on the left, pictures are larger and managing your Circles is easier than before. For one reason or another you may want to see just a few or no updates from certain groups. They may be people you don’t really know or maybe they have annoyed you with too many posts… for other groups like employees or customers you may want to see all of their posts: and this is easily accomplished with a simple slider. As a page manager I appreciate the fact that I can group people and businesses into Circles, a feature I feel is sorely missing from Facebook business pages. Wouldn’t you like a little more control of your newsfeed?